Why would I need a 4th Axis unit? A typical CNC machine is a 3 axis system, meaning that the tool will move left to right, front to back and up and down. (XYZ axis) This means that you are limited to using flat stocks such as wood, plastic sheets, metal sheets or blocks, etc. However, sometimes you want to expand the capabilities of your CNC and machine round objects like table legs, or chess pieces. For this you would need to install a 4th axis system on your CNC. The 4th axis is usually installed along your Y axis (in the front to back direction). When using the 4th axis you zero your gantry so the X axis is set to the center line of the 4th axis system and the X axis will no longer move while the job is being machined. Instead the X axis commands are now being transferred to the A Axis. The A Axis is the rotation of the 4th axis. So as the machine is carving or cutting the stock, The gantry still moves front to back (Y axis) and up and down (Z axis), but now you add in the rotation axis (A Axis) which will rotate the stock as the machine cuts/carves the material. What is the best way to mount the 4th Axis to my STEPCRAFT CNC? The most important thing when installing a 4th Axis system to any CNC is to make sure you have the ability to infinitely adjust the distance between the chuck and the tail stock. This is important if you are not sure what size stock you will be using. The only time this is not as critical is if you are running the same length stock all the time for every job, then you can install the 4th Axis in a fixed location. But assuming that you want maximum adjustability, then you should make sure you have a T-Slot Table. installed on your machine. You will then install the 4th Axis Chuck towards the back of the machine facing the front, along the Y Axis. 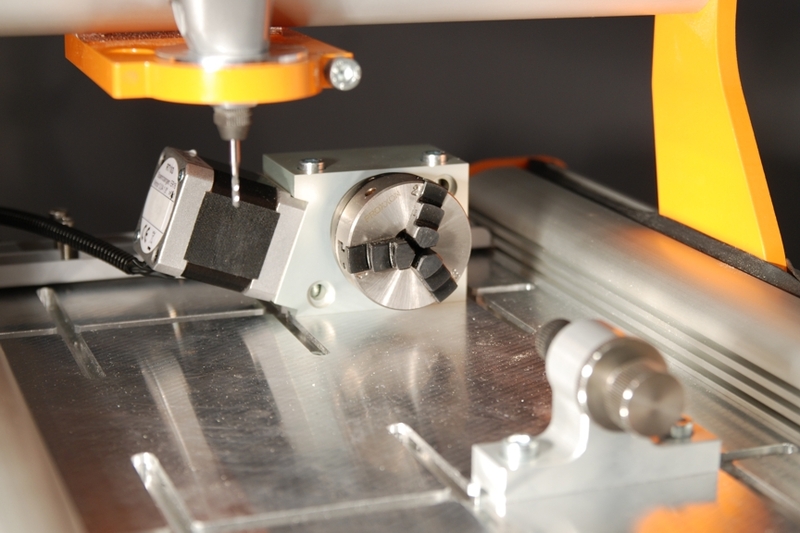 Then the Tail Stock will be installed in the T-Slot channels towards the front of the machine facing the chuck. 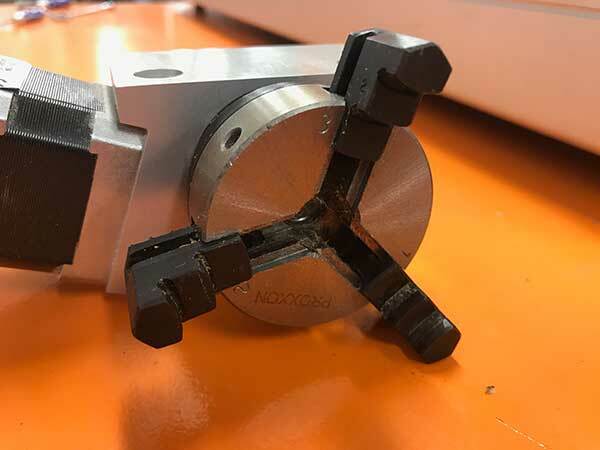 This will allow you to infinitely adjust both the chuck and the tail stock to accommodate any length stock within your machine’s specifications. Is the chuck reversible on the 4th Axis unit? 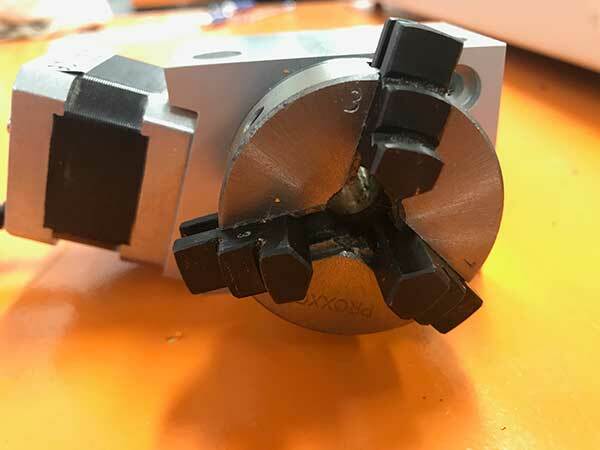 Yes you can remove the three tabs from the chuck and put them in the opposite way to allow for a larger opening for larger stock, up to 2 inches in diameter. To remove them, simply turn the inner ring behind the chuck counterclockwise and the threads will push the chuck tabs out. Then you can flip them around and while putting pressure on them turn the inner ring clockwise and they will be threaded back in. This is with the chuck tabs in the inside position for smaller diameter stocks. Here are the chuck tabs in the outer position to accommodate larger material sizes. Notice the steps in each chuck tab to accommodate various size materials. If I order a STEPCRAFT CNC Ready To Run with a 4th Axis System, will the 4th Axis be ready to use when I receive it? The 4th Axis unit requires a board that must be plugged into the main circuit board on the STEPCRAFT. This board will be installed on Ready To Run machines. 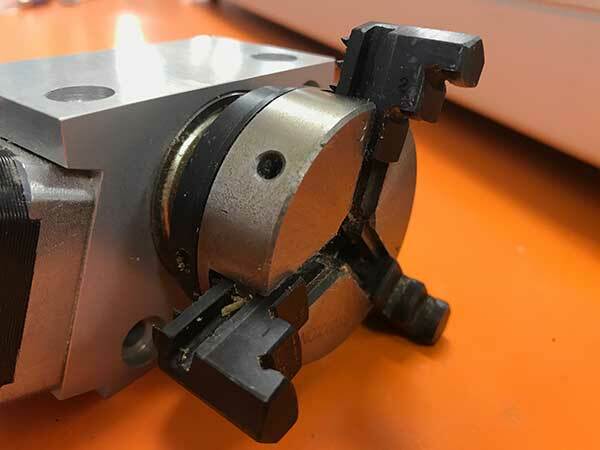 The only thing you will need to do is to mount the 4th Axis unit and Tail Stock on the T-Slot table and plug the serial cable from the 4th Axis unit into the board. Note: it is recommended to maximum flexibility for stock size and ease of use that you purchase a T-Slot table for your STEPCRAFT CNC. How large will the chuck open on the 4th Axis unit? 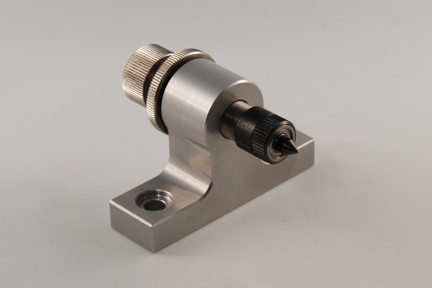 Does the 4th Axis Tailstock have a live center (spin with workpiece)? Yes, the point on the Tail Stock does spin with the work piece. The point rides on a bearing allowing it to freely spin as the workpiece rotates. The Tail Stock is also adjustable so you can move it in and out to secure your workpiece in place without having to use tools. Are all of the machines capable of using the spindle, laser and 4th axis? Yes, you can use all of these attachments on each of the machines. However the small size of the STEPCRAFT-1/210 might make it tough to use the 4th axis with longer work pieces. Additionally, the 210 has a limited 3″ Z height, which does not leave a lot of vertical travel and will limit the diameter of material that you can use on the machine. Additionally you really need a T-slot when using the 4th Axis so you can adjust the tail stock for the length of the work material and the 210 is the only machine that does not have a T-Slot option.